^ Legislation is bi keeng's decree. The Consultative Assembly exists tae advise the keeng. 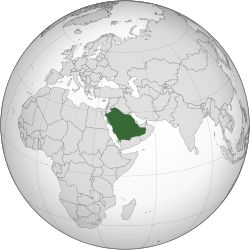 Saudi Arabie, kent offeecially as the Kinrick o Saudi Arabie (Arabic: المملكة العربية السعودية,al-Mamlaka al-ʻArabiyya as-Saʻūdiyya) is a Muslim kintra in the Middle East. It is a kinrick led bi the Saudi ryal faimily, cried the Hoose o Saud an aw. A lot o the warld's ile supply comes frae Saudi Arabie. Acause o this, the Saudi ryal faimily is gey wealthy. Saudi Arabie haes ceeties that are important tae the Muslim releegion. Mony Muslims frae aroond the warld gang tae Mecca in Saudi Arabie tae mak a pilgrimage. The pilgrimage is ane o the requirements o thair releegion. Ither muckle ceeties is Riyadh, Jeddah an Dammam. The pilgrimage is cried hajj in the Arabic. A body wha maks a pilgrimage tae Mecca is cried a hajj in the Arabic leid. Fowk wha arenae Muslim are no allowed tae enter Mecca. Saudi Arabie is hame tae the larigest mass o saund on earth, kent as the empty quarter desert. The temperatur is gey het. Maist fowk spik the Arabic leid. Mony fowk frae ither kintras wark in Saudi Arabie. Thay are cried expatriates or expats. The kintras o Yemen an Oman are sooth o Saudi Arabie. Saudi Arabie is wast o Qatar, the Unitit Arab Emirates, Kuwait, Iraq, an Jordan. Aa o thir kintras cept Jordan an Iraq mak the Arabian Peninsula. The siller, or currency is cried the Saudi Riyal. ↑ The shahada (statement o faith) is whiles translatit intae Inglis as "There is no god but Allah" (an sicweys tae Scots as "Thare is nae god but Allah"), uisin the romanisation o the Arabic wird "Allah" insteid o its translation. The Arabic wird "Allah" lrrterally translates as the God, as the prefix "Al-" is the definite airticle. ↑ "About Saudi Arabia: Facts and figures". The royal embassy of Saudi Arabia, Washington, D.C., United States. Archived frae the oreeginal on 17 April 2012. "Islam and Christianity", Encyclopedia of Christianity (2001): Arabic-speaking Christians and Jews also refer to God as Allah. ↑ "Official annual projection". cdsi.gov.sa. 2014. Archived frae the oreeginal (PDF) on 9 May 2016. ↑ 5.0 5.1 5.2 5.3 "Saudi Arabia". International Monetary Fund. This page wis last eeditit on 3 November 2018, at 17:51.